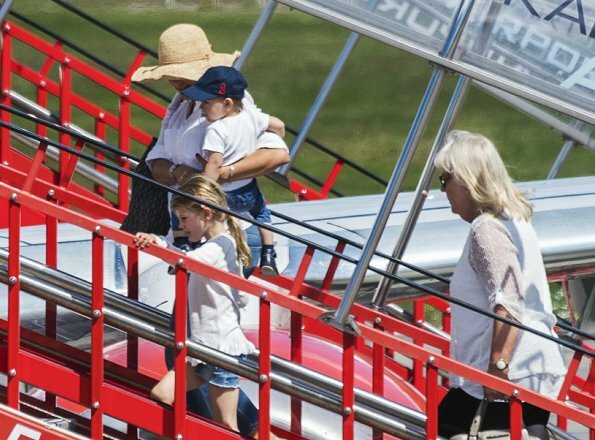 On July 13, 2017, Crown Princess Victoria, Princess Estelle, Prince Oscar and nanny Elisabeth Zimmerman were spotted boarding a plane at Kalmar Öland Airport to return to Stockholm for the Crown Princess Victoria's 40th birthday celebrations. On July 14 Crown Princess Victoria is going to celebrate her 40th birthday. Shame no wonder Prince Oscar is hardly smiling on photos the influence of the nanny? Urgent need for a new nanny for the royal children. The nanny has done a lovely job raising Estelle who has a sunny and charming disposition and knows how to behave in public. So far, Oscar is not an embarrassment either. How do you base your assessment? That she squints in the sunshine, maybe is old enough to be experienced, or is not a skinny teenager? Shame on you for that comment. K Hass nothing wrong with comment. 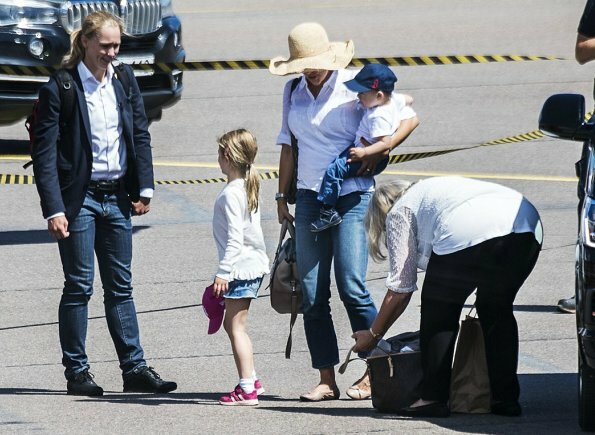 It is time for a younger nanny like Princess Madeleine. She might have done a good hope job with Estelle but she is too old for young children. There is everything wrong with your comment, Anna-Marie. It is offensive and ageist. This nanny is an obviously loved, respected and trusted person who is clearly doing a great job for Victoria and her little ones. Pine and K Hass you are taken my comment out of context. Just relax. Does this nanny still have the skill to protect the two children in the case of a terror attack or try to kidnapped the two children? God forbid this will never ever happen to this royal house or for that matter any royal house. Does she still have the speed and skill to save Oscar life when he choke on a toy part, food or a sweet? Overall her appearance is not what you expect of a nanny. No need to wear brand name clothes or even a uniform, but for sure her hair is too long for her age and especially attending to children. Just think of all the loose hair in the food of the children. Her appearance in these photographs is not good or appealing. It is not an insult it is a fact judging from the photographs. A fact Prince William brought their nanny back just for a very short period of time. There is a time when nannies need to retire and have a well deserved rest. rainha take a sleeping pill with a glass of hot milk and take a good night sleep. You need a rest. I have two magnificent, intelligent, very attractive and well balanced boys. Good night sleep tight!!! You are very funny and I do find you great tonic, you light up my life. Ha Ha!!!!! No I saw her in the cast of Wizard of OZ!!!! I see nothing wrong with this nanny. Does anyone know her personally? She looks fine and nicely mature, which is good because she has a very big responsibility for the young Princess and Prince. Experience is necessary. This old nanny was a nanny for Victoria and her siblings aswell. Victoria called her personally when she expected Estelle. And about Oscar: Victoria recently said that Oscar likes to calm watch people for a while, but he's not afraid of people. 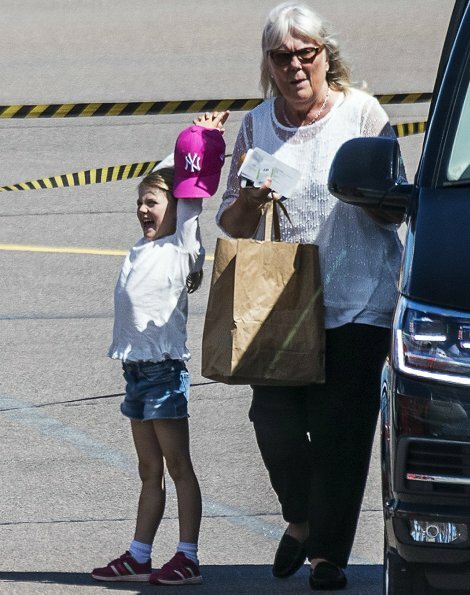 I did not know that Mrs. Zimmerman was Victoria's nanny. Thank you for that info.! That makes her more impressive as she probably came out of retirement to help Victoria. William also asked his childhood nanny to help when Prince George was born. It is a tribute to both nannies that their former charges loved and respected them so much to enlist them for their own children! Oscar was cute when they came out for Victoria's birthday celebrations on Oland. He did smile at his mother. The picture where she is cuddling him and laughing is right after he did it. He seems just like a sweet, thoughtful and maybe bashful little boy. What is crazy are the comments telling the nanny to quit because she is too old!